This dissertation shows how languages differ in their morphosyntactic sensitivity to variations in the semantics of direct objects. Whereas some languages reflect semantic changes of the direct object in its marking others do not. As a result, we observe mismatches between semantic and morphosyntactic transitivity in the latter type of languages. This becomes particularly clear in a detailed study of the cognate object construction in English. Besides, this dissertation shows that a cross­linguistically uniform phenomenon can be driven by various motivations. This is demonstrated for differential object marking, a cross­linguistically recurrent phenomenon in which direct objects are overtly case marked depending on their semantic features. Two factors appear to govern differential object marking cross­linguistically: prominence­based marking and recoverability of grammatical roles. 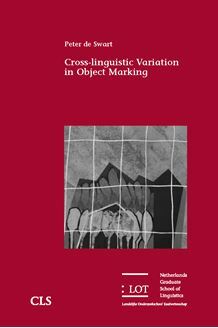 For some languages only one of these factors can be identified to be of importance, but in other languages, they are simultaneously responsible for object marking. In order to accommodate the full pattern of differential object marking, a bidirectional optimality­theoretic model is developed in which speakers take into account the perspective of the hearer. By doing so, this study nicely shows how typological and optimality­theoretical insights can be combined in order to gain more insight in the interaction of the universal principles that guide the marking of direct objects in natural language. Therefore, this study is of interest to researchers of various linguistic backgrounds concerned with the interaction between semantics and morphosyntax and more specifically to those interested in the areas of transitivity and case marking.